Born for big days in big terrain, we proudly introduce the girthy tire-equipped Santa Cruz Bicycles Hightower C R+ Complete Mountain Bike. This particular build is equipped with 27.5"+ wheels for elevated traction and momentum through berms and softer conditions, but it's worth noting that the adaptive "High/Low" geometry will also accommodate 29" wheels if you prefer more straightline speed and enhanced rollover. When it comes to the build kit, this bad boy comes complete with a lightweight carbon frameset and highly capable 1x11 SRAM NX drivetrain. If you're the type of rider who loves logging miles of meandering singletrack, but doesn't want to hold back when things get spicy, look no further than the Santa Cruz Bicycles Hightower C R+ Complete Mountain Bike. 135mm VPP® Suspension  VPP is based on the patented principle of having two short links rotating in opposite directions. This system provides huge design flexibility, allowing Santa Cruz to manipulate shock rates to the intended purpose and character of each model; from short travel endurance bikes to World Championship winning DH machines. 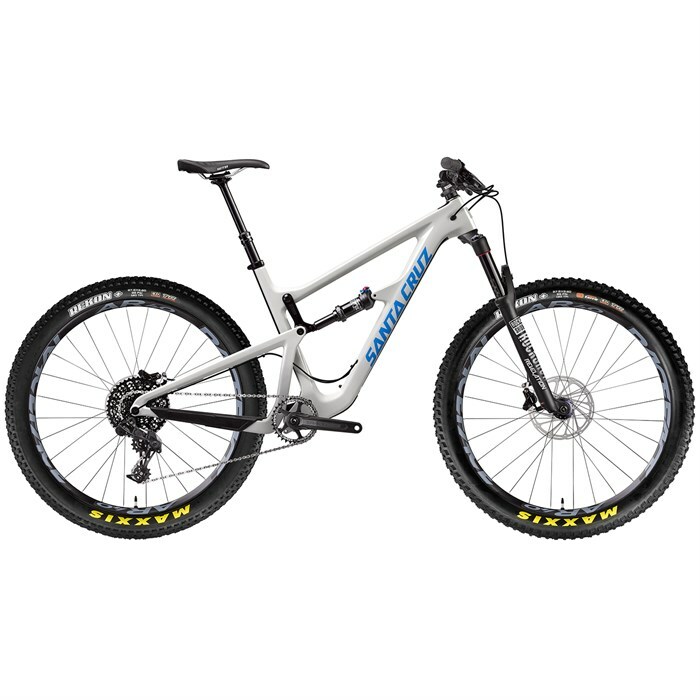 29er & 27.5+ Compatible  Accepts both 29er and 27.5+ wheel/tire combos. RockShox Revelation RC  Revelation has grown. After many years as the original long travel trail fork, the new Revelation is ready to tackle the most demanding trail and enduro rides. The chassis is directly derived from the new Pike, with 35mm upper tubes for unmatched stiffness and to pair with the aggressive look of modern trail and enduro bikes. SRAM NX Drivetrain  It's how you start that matters. Whether you're discovering the mountain for the first time or you're an MTB lifer searching for a no-nonsense, no-worries 1x drivetrain, SRAM NX is ready for action and ready to take you there. NX brings you a wide range of gear choices engineered for simplicity and durability, so you can focus on what matters most -- the ride ahead. German engineered and proudly bearing the SRAM 1x stamp of approval, NX is ready to let the world know what real riding feels like. Maxxis Rekon+ Tires  The Rekon+ is an aggressive trail tire inspired by the Ikon+ for intermediate and technical terrain. Wide knobs down the middle provide control under braking and L-shaped side knobs assure support when carving loose turns. With confidence like this you can race more and scout less with the Rekon+.